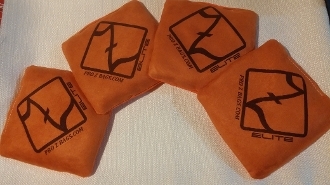 The PRO Z ELITE Canvas Tournament Series bags. Your standard Stick & Stay tournament bag. High in quality and very durable. Precision template sewn construction of Canvas and Upholestry Suede. Filled with a blend of premium recycled resin that will never break down or change weight. The Elite gives you a tournament quality bag inside and out. Under normal conditions this is a great bag! Pitch it like a Pro with Pro Z Bags!